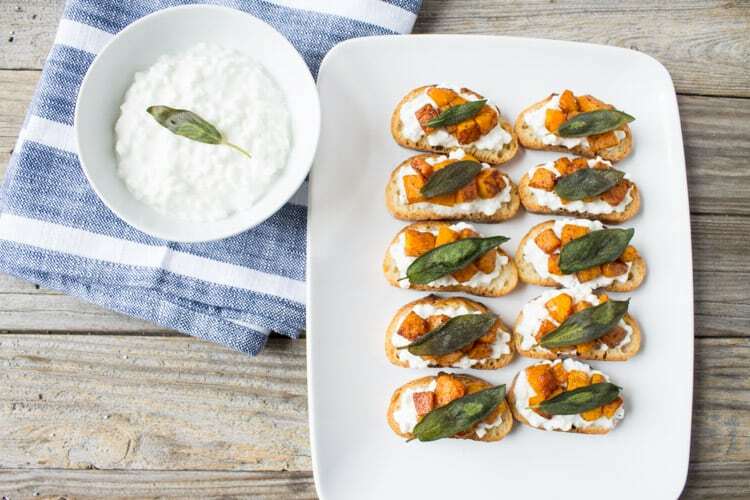 Sweet, savory and satiating, this butternut squash and sage crostini made with cottage cheese is the perfect comforting appetizer for your Thanksgiving menu. Guys. It’s ONE WEEK from today!!! Thanksgiving is JUST around the corner. This year, my Mom has to work on Thanksgiving (Wahhhhh!). It’s the first time this has happened since…EVER! As much as I want to protest, I am realizing this means I get not one, but two Thanksgivings. Hollaaaaa. We will have Thanksgiving on Wednesday night and then I’ll head to Steve’s family’s Thanksgiving on Thursday. Win-win. Two tofurkeys? Two servings of mashed potaters? Don’t mind if I dooooo. This version is a little sweet, a little savory, and a little, a LOTTA delicious! 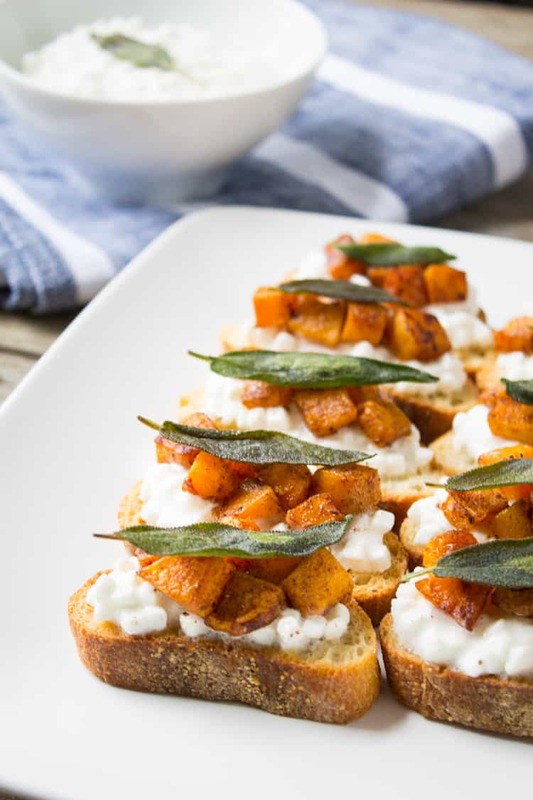 The sweet butternut squash contrasts the savory sage and it all comes together with creamy, satisfying cottage cheese. Plus, it’s a healthier holiday app you can enjoy without any guilt. 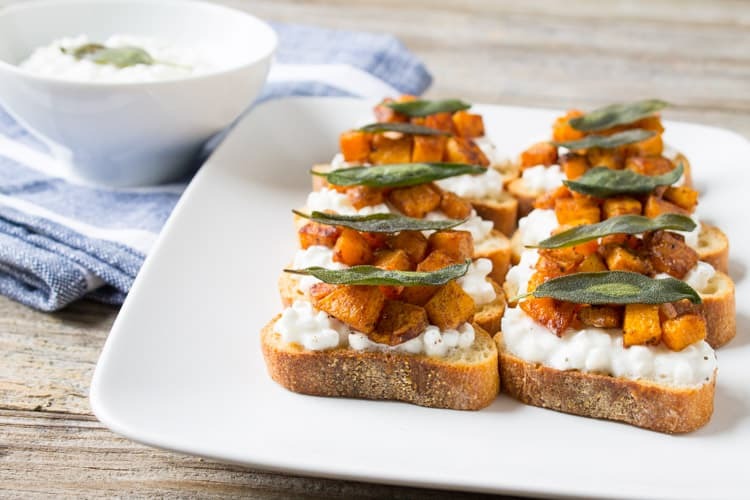 Butternut squash is loaded with nutrients – it’s a good source of fiber, potassium, magnesium, and an excellent source of vitamins A and C and cottage cheese is protein-packed with 13 grams of protein and 10% of the daily value for calcium per ½ cup serving. Hoooooray for Turkey Tofurkey Day! In a medium mixing bowl, combine butternut squash, 1 ½ tablespoons olive oil, pumpkin pie spice, ¼ teaspoon salt and ¼ teaspoon pepper and toss to coat. Transfer butternut squash to baking sheets and roast in the oven for 20-30 minutes, or until tender and lightly browned. Reduce oven to 375 degrees F. Lightly brush both sides of bread with 1 tablespoon olive oil and sprinkle with ¼ tsp salt and ¼ tsp pepper. Transfer bread to two baking sheets and bake for 8-10 minutes, flipping slices over halfway through. Let bread cool. In a small saucepan, heat 1 ½ tablespoons olive oil over medium heat. Add sage and cook for 2-3 minutes, or until leaves darken and the edges just begin to curl. Set sage aside on a paper towel to dry. In a small mixing bowl, stir in ¼ teaspoon salt and ¼ teaspoon pepper to cottage cheese. To assemble the baguettes, spread cottage cheese on top bread (approx. 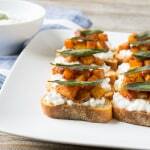 ½ tablespoon) and add a spoonful of butternut squash over top. Top each slice with a sage leave for garnish. Serve immediately. I can’t believe it’s only 1 week away!! Still so much planning and shopping to do. 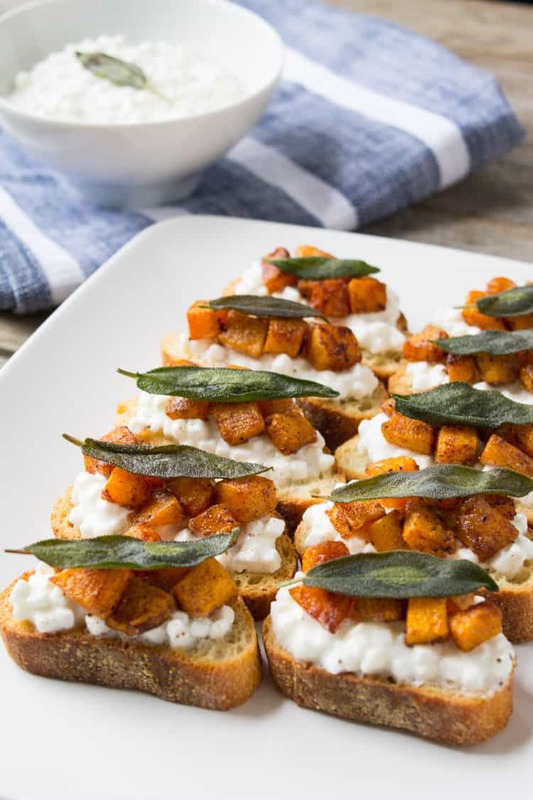 These crostini have absolutely everything I would want in a Thanksgiving app- yum! Enjoy your two Thanksgiving dinners- so much fun! Thanks, Sonali! Have a happy Thanksgiving! Oh my goodness woman! 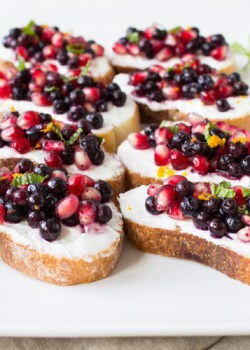 You and your ADORABLE crostini’s! I am obsessed. 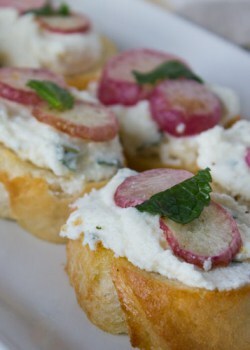 I better just have a holiday party already so I can make all of your cute appetizers! Pinning to the other lovely recipes I have of yours… maybe I should create a TFD board on my Pinterest :). Happy Turkey Day!